A man accustomed to communicating, he knew how to find just the right words to talk about his photography exhibition, Somos (We Are), a new, mature project preceded by the magic and mystery of Raices (Roots), shown December 2015. Furthermore this artist, who considers himself an apprentice, says he has scrutinized the present facts of his existence, those that have allowed him to follow an inspiring life path with courage and clarity. When on occasions different paths intertwine in the course of his daily travels, he turns around the awkward or uncomfortable situation and without losing heart he stops, thinks and continues along the path of perseverance where he’ll find without doubt the truth. That is when he finally begins to realize who he’s been, who he is and where he’s going. He is a documentarist, photographer, producer, writer, lover of journalism, and I dare say he is slightly mad, but mad about life: sensibly crazy about his raisons d’être: his family and his work. “Since I was very young I was always asking myself who I was and where I was going. Now I’m not so young, that questioning voice comes to my pillow now and then and keeps me company, even though I’ve given her enough answers by now to know who I am,” he says. The exhibition entitled Somos (We Are) represents for the artist a reconvening with the African ancestors and, in his opinion, a voyage to the spiritual paradise of those who were forced to leave their native lands. 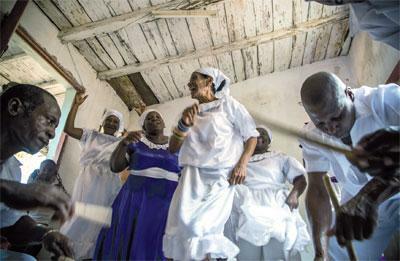 Somos regales us with symbolism, it is an evocation of the Palo Monte cults whose rituals stand out as some of the oldest ceremonies of African origin in Cuba. The Cuban anthropologist Jesús Guanche captured the essence of this exhibition when he transcribed a message from Tata Nganga, a Yoruba ritual practitioner, who asked on one occasion: “¿Somos o no somos? (“Are we or aren’t we?”) The participants at the ceremony answered in one voice: “¡Somos!” (“We are!”) thus demonstrating with certainty their faith in Enrique Hernández Armenteros, popularly known as Enriquito de La Hata, the late Bantu priest and the proclaimed “Illustrious Son” of the municipality of Guanabacoa in Havana. This reference to Enriquito is not coincidental, it is intentional. 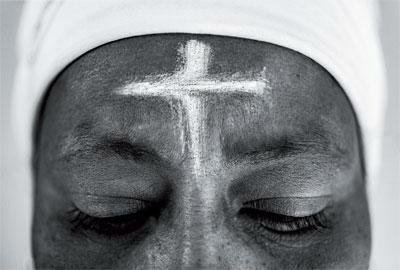 Enriquito is a part of a people’s cultural heritage, and he had a long history in the practice of Afro-Cuban religion. “With boundless wisdom, he conveyed confidence and companionship in every conversation, which is why we dedicate this series of portraits to his memory,” said the artist. In June 2016 Somos travelled to New York and Norddeich in Germany, however that was just the beginning of what today has unfurled into an exhibition with a deep sense of belonging. “This series grew. Some of the photographs are now larger prints that include objects and others are recreated images that were unedited till now,” says Chile. This is a project in progress, in motion, which began in 2010 in Guanabacoa - a place where, according to the artist, Afro- Cuban religion inhabits even the rocks. 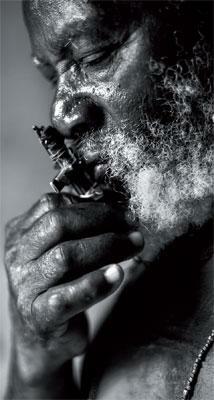 “In my search for these faces, some that appeared were captivating from the beginning,” he continues. “But it wasn’t just these features that ignited the blaze that sharpened my senses. I was also seduced by the African syncretism, the symbols they use, the sanctuaries, the rituals and a marvellous real world that I’ve tried to capture in my photographs.